When the dust settles in Cairo, at least long enough to make out anything through the smoke and flames, it may turn out that the Muslim Brotherhood has suffered its worst blow at the hands of none other than Barack Hussein Obama. . The blow will not have been intentional. Like the killing of Bin Laden, a useful intervention carried out by Navy SEALS who were perhaps less than enthusiastic about Obama's plan to use the civilian trial of the terrorist leader as a prop for dismantling the military tribunal system, it wasn't something that he meant to do. Obama could never have intentionally defeated the Muslim Brotherhood. But he may have just hugged it to death. To understand the Middle East is to understand that such petty things as the deaths of hundreds of protesters or massive street fighting don't really matter all that much. Not in a region where Saddam Hussein or the butchers of Sudan could pile up enough corpses to start an entire country and still enjoy the support of the Muslim world. The trick is killing the right people. Saddam Hussein killed Shiites and Kurds with religious and ethnic differences from the region's Arab Sunni baseline. Sudan killed Christians and Animists who are infidels and rebellious dhimmis making them even more foreign and more 'killable". It is that foreignness which is all-important. Muslims are not supposed to kill Muslims unless they're somehow 'foreign' either by being members of a heretical sect or a different ethnic group. And if all else fails, they can be pawns of foreigners. That is why both sides in Egypt keep accusing each other of being Jews. Osama bin Laden aimed at America to hit the House of Saud because it allowed him to charge the Guardians of Mecca and Medina with being American puppets. It made internal terrorism justifiable. That is the charge that has been laid against the Muslim Brotherhood. It is what makes killing them of no more note than a minor change in the weather. The only charge against the Muslim Brotherhood that matters is the charge of "foreignness". Obama's embrace of the Muslim Brotherhood made them into fair game in the Muslim world. Despite its Egyptian roots, the Muslim Brotherhood is a transnational organizational, and like any transnational organization, that makes it both foreign and suspect. Its ties to Hamas, a foreign group viewed with suspicion in Egypt, despite the supposed global Muslim affinity for the Palestinian cause, add another element of foreignness that will come into play during the trial of Brotherhood leaders. And there is Qatar, a foreign country, widely despised, with too much money and power, whose ties to the Brotherhood are blatant and whose dubious financial deals with the Morsi government should provide more than enough material for a conviction. But Qatar is still an Arab and Muslim country. Obama is the real lever for bringing down the Muslim Brotherhood. Linking the Brotherhood to him along a chain that includes Qatar upstream and Hamas downstream, that plugs in the hated CIA and Israel, can destroy the Brotherhood not just organizationally, but politically as a credible alternative. Reducing the Muslim Brotherhood to a CIA puppet in the eyes of the Muslim world will destroy it so thoroughly that it will become forever irrelevant. The military and the opposition understood immediately that the only way the overthrow of Morsi could be made palatable to most Egyptians was by portraying it as a fight not merely against the Brotherhood, but against a conspiracy between Washington and the Brotherhood. 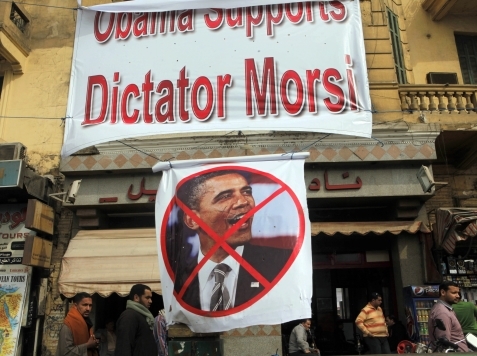 The Egyptian people might be divided on Morsi, but they could be united against Obama. Their plan was to hang Obama around the Muslim Brotherhood’s neck. The Muslim Brotherhood belatedly scrambled to portray the coup as an American-Zionist conspiracy, but it was late to the party. 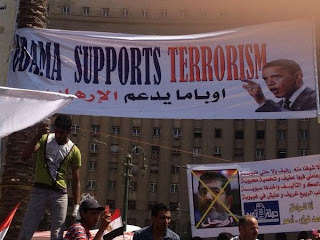 Tahrir Square had already been choked with banners demonizing Kerry, Obama and Anne Patterson for their support of the Muslim Brotherhood. The Brotherhood had trouble making the case that its downfall was a plot by Obama, when Obama kept insisting that the Brotherhood's leaders needed to be released and returned to power. Obama played beautifully into the opposition's hands by following the standard diplomatic playbook, denouncing Morsi's overthrow and urging the release of Muslim Brotherhood leaders. It was a plan that made sense in Washington, which reflexively thinks in terms of issuing orders all the time, but in Cairo it looked like the puppet master demanding the return of his puppets. The Egyptian military had stepped in as a response to a national emergency dealing with foreign intervention in Egypt's political system. The more Obama denounced the military's actions, the more he was demonstrating that the Egyptian military had been correct to step in. Despite his years in the Muslim world and his family connections, Obama had not really understood how Egypt worked. And his associates understood it even less. If they had, they would have pulled out Anne Patterson once she became a target and openly criticized Morsi for not listening to the demands of the protesters, while privately conveying a message of support. Instead Obama hugged Morsi to death. And he's still hugging Morsi to death. The American emissaries who met with Muslim Brotherhood leader Khairat al-Shater in prison did it with about as much fanfare as they could muster. The Muslim Brotherhood spokesman frantically tried to deny that the meeting happened or that Khairat al-Shater had been willing to even talk to Deputy Secretary of State William Burns, but that just made the Brotherhood seem like a bigger bunch of liars. And why else would they lie about a meeting with American diplomats unless they were trying to hide that they were really puppets of Uncle Sam? It couldn't have gone any better if Obama had planned it. Sadly Obama would never have planned it and that made the scene all the more absurdly delicious. 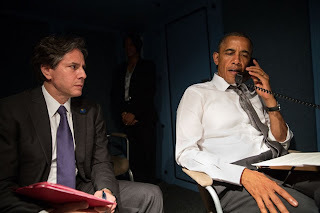 The Muslim Brotherhood wanted Obama to shut up and stop loudly intervening on their behalf. But Obama couldn't stop following the liberal playbook and sticking up for his beloved Brotherhood. The nuanced administration was completely lacking in nuance and didn't even know it. Obama's entire plan to bring the Muslim Brotherhood to power had laid the seeds of its destruction. The insistence on having Muslim Brotherhood members at the Cairo speech, the demand that Mubarak step down, the urging of rushed elections that benefited the Muslim Brotherhood; the entire process by which Obama helped the Muslim Brotherhood come to power became its indictment. The Muslim Brotherhood's violent past was ugly, but terrorism is not the ultimate offense in the Muslim world. Muslims support terrorism when fighting foreigners or foreign influences. Treason, the willingness to become a foreign influence, is the ultimate crime. If the Egyptian legal system, that the Muslim Brotherhood tried and failed to destroy, succeeds in convicting the Muslim Brotherhood of serving foreign interests in the court of public opinion, it will have dealt it a serious blow that the Brotherhood will spend a long time recovering from. In Washington, Obama still continues misreading events as a military coup. The protesters parading around Cairo with Islamic photoshops of his face picked up from American conservative sites are a minor irritant to be dismissed with another of his condescending speeches as if they were Tea Party members. The problem is tackled with arbitrary denials of foreign aid, pressure phone calls and a touch of diplomatic isolation. And the generals and liberals are laughing to themselves, the way that the Muslim Brotherhood leaders used to at their cleverness in tricking Obama. But the Brothers aren't laughing anymore since Obama became the weight around their ankles pulling them down. And they can't even let go of him because they have no other leverage except international pressure. There's only so much Qatar can do against the united front of Saudi Arabia, the UAE and most of the rest of the GCC ensemble. Turkey can spit and stomp its legs, but it doesn't have any other leverage. That leaves Obama, who has the Muslim Brotherhood's back, but lacks the paranoid subtlety that passes for local politics, and the European Union, which is more subtle, but also more greedy. Egypt's new government knows that it won't win over Obama or Ashton any time soon. But it isn't trying to. Instead its goal is to smash the Muslim Brotherhood leaving it the only game in town. And then Obama and the EU can take it or leave it. Osama tried to bring down Saudi Arabia by attacking America. The new Egyptian government is attacking America, domestically, to bring down the Muslim Brotherhood. It's the typically indirect politics of a xenophobic region where not only don't you see the knife coming, you also never find out why you were stabbed. While Obama played checkers with the region, its power players had gotten out their chessboards and deftly checkmated yet another Western regime change project. With the typical slowness of the obtuse, Obama still doesn't understand that he lost or what the game even was. Obama and Kerry believe that they are men of nuance, but they are crude, loud and obvious compared to the men that they are up against who have outplayed them in Egypt and are ready to begin burying the rotting corpse of the Arab Spring beneath the Sinai sands. You're right, we conservatives could not have more to be proud of than mclame/gcracker meddling in a sitch without a better hitch. BTW, that soggy arabia moolah likely came from US. Fantastic piece from beginning to end. Not sure that the opposition are just setting up Obama. Obama cared far less about the Iranian protestors that got shot in the streets. 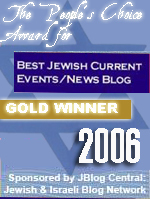 He pretends to want a peace agreement for Israel but he embraced the very group that killed Sadat for making peace. He has high level MB members in the State Department (Huma Abedin). He also doesn't seem to care much about the U.S. which tells the Egyptians he's more shyster than statesman. They probably see Obama caring as much for Morsi as he did for Trayvon Martin. If he is supporting a cause its for his own good and why shouldn't Egyptians nail the MB for selling out to this guy? "Obama's embrace of the Muslim Brotherhood..."
That action would land any other American in prison for a very long time. Absolutely fantastic. The best thing I've read on the entire current situation in Egypt. Hats off to you sir. Dressing. This article implies we wont see the Egyptian cities fighting against each other. And I was looking forward to seeing the prophecy fulfilled and these backstabbing, two faced, lying bastards slitting each others throats. Great post. It also helped frame for me the troubling alliance now of the Qatar Foundation and UNESCO pushing what are to be ed reforms in the West, including the US. In 2009 it began hosting WISE--World Innovation Summit in Education to globalize the desired vision. I can see how not knowing much and assuming all perspectives are equally valid would be a winner for backers of the MB. Very enlightening message, and I do believe you got it right. Thanks for explaining it so succinctly; my eyes did not glaze over even once (for a change). Generally, your best gets lost in a lot of extraneous information that I, maybe alone, find confusing. You don't have to post this, as it is personal. Enjoy your stuff every morning, but too often I wonder if I got enough sleep. Giving us so much needed info for our understanding. Profound! Great article and makes me realize just how complicated the situation is in the Middle East. Nothing anyone does will matter. There will be a Third World War, and if there isn't, the radiation Japan releases daily is going to wipe us all out within a few years. What a mess. All the more puzzling to see Bibi kowtow to their "request" to release sadistic murderers for zip, nada, zilch, efes in return. 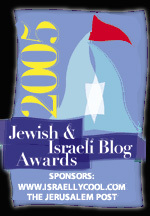 I don't give a dam* anymore who sits in the WH......we're in dire need of a Jewish leader worthy of the appellation.